Standard Ducting for Ventilation at Intech | 8 Inch by 3Ft. For replacing existing ducting or to complete entirely new set ups in work spaces requiring ventilation, Air Systems International has a complete line up of standard ducting for ventilation. Size available and custom orders will ensure that you are operating safely and efficiently on any job requiring ventilation and ducting. Old, existing ducting can experience wear and tear over time, and replacement may become necessary. In these instances, choosing standard ducting by Air Systems provides an array of choices and added durability to extend the use life. 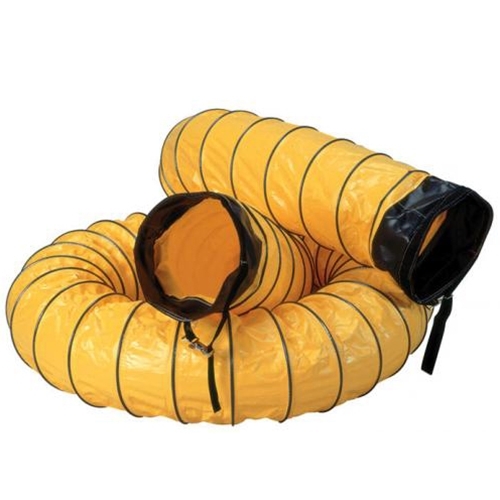 This 3 foot, 8 inch in diameter standard ducting SVH-3 is made of a vinyl polyester combination and standard external wear strips are available in custom sizes to best fit your job site demands. The internal wire hoop is a reinforced steel, with a 5 inch pitch. Each standard ducting piece by Air Systems International also comes with a 6 inch attachment on both ends that is 8 and 3/8 inches around, and features belt straps that are adjustable. Rated for max temperature of 180 degrees Fahrenheit, covering a wide variety of applications to provide more return on your investment. The SVH-3 is ideal for short run applications, and Air Systems also provides 6 foot, 15 foot and 25 foot standard ducting for ventilation as well as a full selection of conductive ducting. Connectors, transition pieces and other accessories round out their line up for ducting and parts, and as a manufacturer, custom orders can be accommodated as well! Shop the entire product line, including breathing air equipment and other ventilation related supplies, right here at Intech Equipment online. Our experts are available to help guide through selection and purchasing, or simply place your order online day or night. For any custom requests or to discuss additional questions, give us a call prior to placing your order.